The contents of the Will are of little interest, but we should note that Peace owned land in Debden, some twenty miles away from Orwell. As regards the handwriting in the Will, the writer hovers between the archaic 'the,' where the letters 'th' are run together to make the letter known as 'Thorn' followed by an 'e,' and the later form of writing the word 'the' where the thorn has been altered into a letter 'y,' which then makes the word into 'ye.' Copies of the two versions are shown below. The old form of letter 't' is a very small downstroke, and 'h' has a long tail below the line. Compare these with the modern forms of 't' and 'h' in the line above. There is also the modern form 'the' which is used in the attestation clause. The Will writer uses the modern 'the' as well! It looks as if the Will might have been written by James Adames, since his signature resembles the handwriting in the Will. 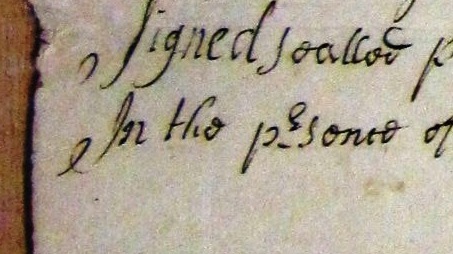 The signature of the first witness is not easy to read, but a Daniel Godfrey died in 1726, so it might have been him. 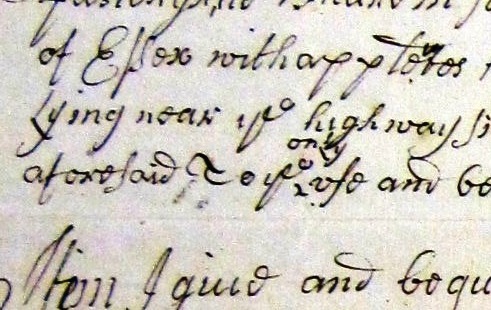 The Parish Record of her burial says "a dissenter buried in the churchyard the offices not read." 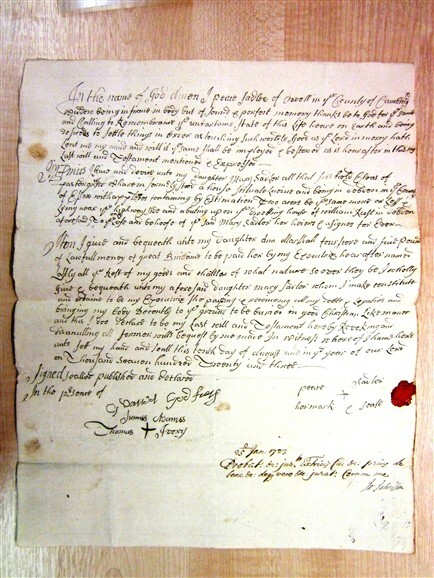 Transcript of the Will of Peace Sadler 1723. This page was added by David Miller on 18/08/2013.